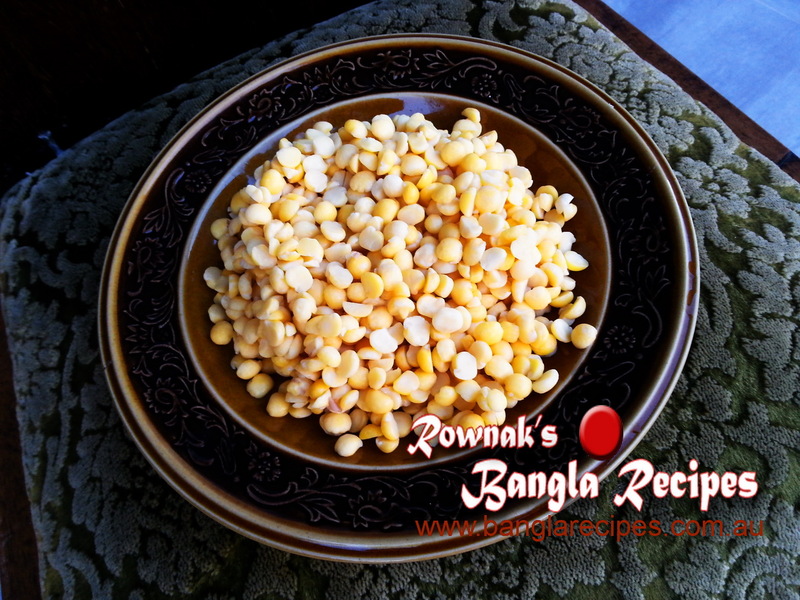 Chana Dal Halwa / Cholar Daler Halwa/ Booter Dal Halwa/ Split Chickpeas Fudge is a dessert made especially on Shab-e-Barat night. It is my most favourite halwa. It is delicious by itself, but can be eaten with luchi, rice flour bread or paratha. Soak Split yellow Chickpeas in water for 4 hours to overnight. Wash and Boil it in water till it becomes tender and make paste of it to use food processor or traditional way (sheel pata). Heat a pan if possible non-stick with 1 tablespoon ghee and fry nuts and raisin for minute. Remove it for ghee and keep aside. In same pour rest of ghee and add cinnamon sticks, bay leaf and cardamoms. Stir for a bit and add chickpeas paste. 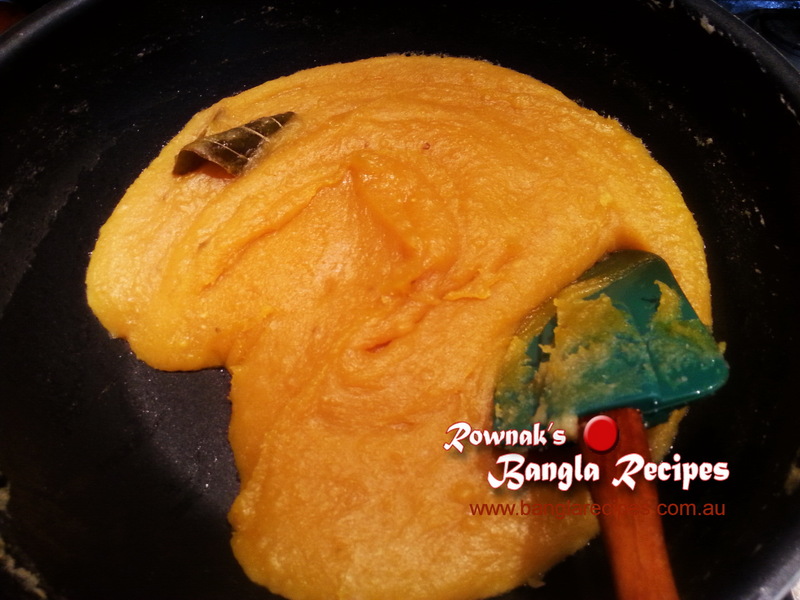 Cook it on medium heat and stir constantly so that the dal does not stick to the bottom of the pan. When all sugar has been added and mixed; add milk, 2/3 nuts and raisin. When halwa comes off from the pan and moves easily in circles with the cooking stick. The halwa will not be spread all around in the inside of the cooking pot, but will rather adhere to the cooking stick like dough. 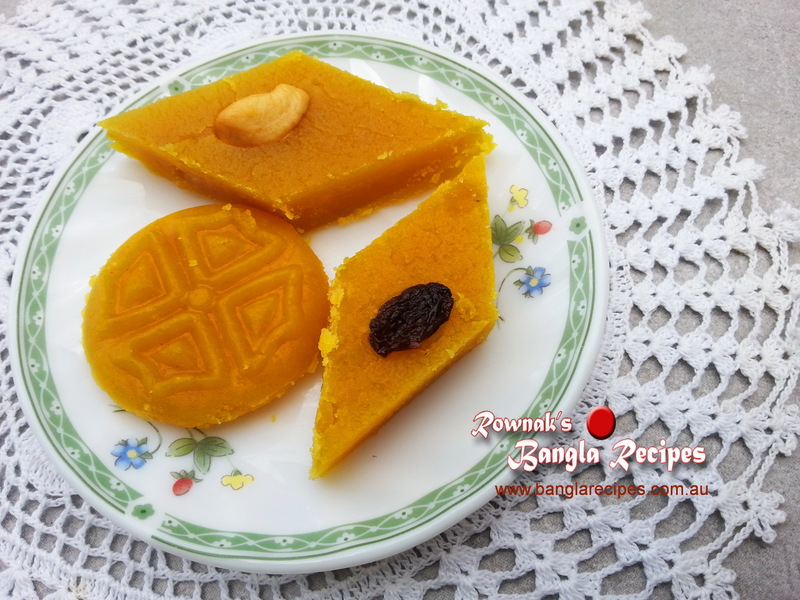 Pour in ghee greased serving plate or garnish Chana Dal Halwa / Cholar Daler Halwa/ Booter Dal Halwa/ Split Chickpeas Fudge with rest of nuts and raisin and give your desired shape traditionally in diamond shape. I prefer to use pressure cooker to boil the chickpeas. Stirring and pure ghee are two main keys for good halwa. If you want , you can use more ghee. you can even use about double amount of ghee , I used here. I brought those mold from Bangladesh. Thanks for your good words. 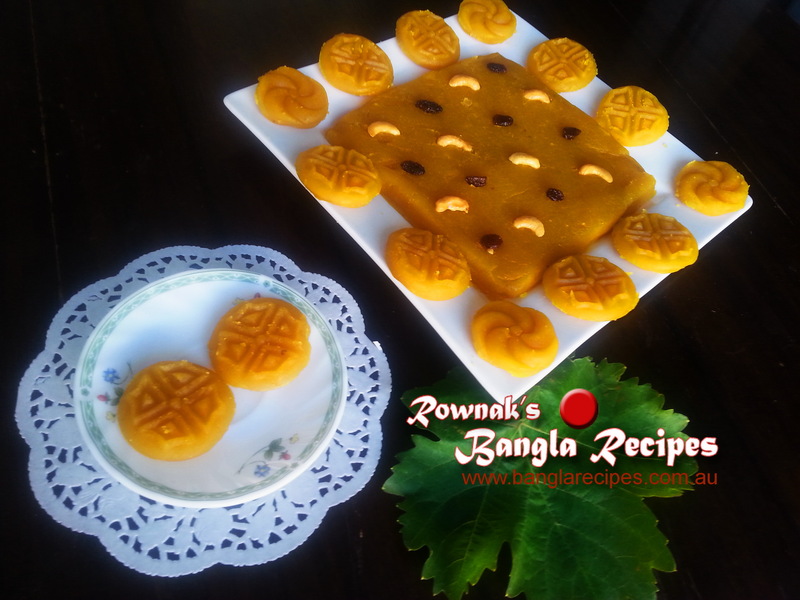 Thank you for your great recipes, we have been out of Bangladesh for thirty nine years, I forgot many good food specially our traditional sweets, your recipes really help me to recreat them. Love them, I love you for your great work. 39 Years !! !this is a long time. When I start my website, it was my food dairy for my daughter. May be like you , my daughter will find helpful in future. I am happy and get excited to see that I bring happiness, joy And make nostalgic lots of people. If you specifically want any recipe, please let me know.